This section serves as an introductory tutorial on the Compare & Contrast strategy. 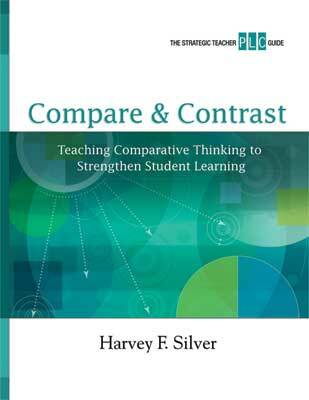 In this section, our goal is to help you understand how you currently use comparative thinking in your classroom and to explain the Strategic Teacher approach to the Compare & Contrast strategy. Reflect on your own experiences with comparative thinking strategies. Explore the research, principles, and classroom phases that make Compare & Contrast such an effective strategy. Examine a range of student work that demonstrates comparative thinking. Experience a model lesson using the Compare & Contrast strategy. Comparative thinking is one of our first and most natural forms of thought. When we are infants, one of the first differences we must identify is that between mother and other. Without the ability to make comparisons—to set one object or idea against another and take note of similarities and differences—much of what we call learning would quite literally be impossible. You may be wondering why we want to look so closely at comparative thinking. What makes it so special? The answer lies in the research of renowned educators Robert Marzano, Debra Pickering, and Jane Pollock (2001). By compiling the available research on effective instruction, Marzano, Pickering, and Pollock found that strategies that engage students in comparative thinking had the greatest effect on student achievement, leading to an average percentile gain of 45 points (p. 7f). More recently, Marzano's research in The Art and Science of Teaching (2007) reconfirmed that asking students to identify similarities and differences through comparative analysis leads to eye-opening gains in student achievement. Activity: How Do You Use Comparisons? 1. Why Compare & Contrast? What use does it have in your classroom? 2. In what situations do you feel comparison works well? 3. What are the steps you use in teaching students how to make comparisons? 4. What might your students' work be like if they made better comparisons? What Can Compare & Contrast Do for You and Your Students? By focusing student thinking on analyzing pairs of ideas, the Compare & Contrast strategy strengthens students' ability to remember key content. Compare & Contrast acts as a practical and easy-to-use introduction to higher-order thinking. Compare & Contrast improves comprehension by highlighting important details, making abstract ideas more concrete, and reducing the confusion between related concepts (think meiosis versus mitosis). The Compare & Contrast strategy strengthens students' writing skills by providing a simple structure that helps them organize information and develop their ideas with greater clarity and precision. In their years of research into the defining characteristics of intelligent behavior and thought, Art Costa and Bena Kallick (2008, 2009) have identified 16 “habits of mind.” By nourishing these habits in our students, we give them the tools they need to use their minds well, thus increasing their chance for future success. Using Compare & Contrast in the classroom will help students develop these habits of mind: thinking flexibly; thinking about thinking (metacognition); striving for accuracy; applying past knowledge to new situations; and thinking and communicating with clarity and precision. Answer the question below and then discuss your answer with your neighbor. Which of the five goals of the Compare & Contrast strategy is most important to you, and why? The next few pages show the kinds of work students create while engaged in Compare & Contrast lessons. Figure 1.1 includes a variety of student work samples that span a wide range of content areas and grade levels. As you examine this work, ask yourself, What skills are students demonstrating in this work? What skills were evident in these student work samples? Use the space below to record your thoughts, then discuss your response with a partner. We all want our students to produce this kind of work—to be able to use comparative thinking independently to advance their own learning. To help us achieve this goal, let's turn our attention to the four principles and the four phases of Compare & Contrast. Each principle is tied closely to the difficulties students commonly encounter when they engage in comparative thinking. You'll notice that the four principles of Compare & Contrast are closely aligned with the four classroom phases of Compare & Contrast. Leading your students through these four phases is essential for ensuring your students' effective use of the Compare & Contrast strategy in the classroom. A classroom poster highlighting these four phases for students is included in this guide. Figure 1.2 shows the four principles and corresponding four phases of Compare & Contrast. Now that you have a better understanding of the four phases of the Compare & Contrast strategy, take a second look at the student work samples in Figure 1.1. Each of the four phases is represented by at least one piece of student work. Can you determine which work samples were developed during which classroom phase? The ability to explain the importance of analyzing narratives and documents from different times and places to understand historical events. As you review this lesson, keep in mind the principles of Compare & Contrast, the role of the student, the role of the teacher, and the goals of the strategy. We also encourage you to be the student by completing the student activities throughout the lesson. The “hook and bridge” is meant to hook students into the lesson by creating bridges between students' prior knowledge or personal experiences and the content of the lesson. It also focuses students' attention in preparation for the lesson ahead. How are households similar and different? Recognizing that I, like all men, will one day perish, I invited my daughter, little Katy, into my study. I told my child that I am to die shortly, and she must, when I am dead, remember everything I said unto her. I set before her the sinful and woeful condition of her nature, and I charged her to pray in secret places every day without ceasing that God for the sake of Jesus Christ would give her a new heart. I wished her to live happily under God and abide by the laws governing her existence here. I gave her to understand that when I am taken from her she must look to meet with more humbling afflictions than she does now [when] she has a careful and tender father to provide for her. You'll notice that even at this early stage of the lesson, students are engaged in addressing state standards by analyzing primary documents from different time periods. Now Joanne asks students to use the criteria provided in the description organizer (see Figure 1.3) to describe each household. You'll notice that we have added a section to the right for you to record your own thoughts on the lesson. This is part of a process we call “Do, Look, Learn.” Too often, we go through the motions of learning a new process or idea without reflecting on our own thinking. As you “do” the lesson, “look” in on your own thought process to see what you can “learn” from your own experiences. Thinking About Phase One: Thorough descriptions framed by clear criteria lead to deeper and richer comparisons. The more students are encouraged to think about details and specifics in their description, the easier and more sophisticated their comparisons will be. Take a moment to look back at the readings with the criteria from Figure 1.3 in mind. How do the criteria affect your thinking? Note that criteria are not perfectly synonymous with critical attributes. Most comparison strategies ask students to focus their attention on critical attributes, which are the defining characteristics of the items under investigation. Critical attributes are always a good starting point for helping students to focus their attention on the essential information, but sometimes we want students to go beyond simply describing the items by these attributes. For example, if students are describing renewable energy and nonrenewable energy, we may want students to consider not only the critical attributes (e.g., the sources of the types of energy, how each type is used) but also the factors that put renewable and nonrenewable energy into a larger context (e.g., arguments for and against each type of energy). Joanne now moves her students into the comparison phase by having them work with partners to identify similarities and differences between the two households and then to record those similarities and differences using the Top Hat Organizer (see Figure 1.4). Thinking About Phase Two: Notice how much easier it was to conduct a comparison having already completed detailed descriptions of the readings. These first two phases encourage students to use details and evidence from the readings to support their comparisons, and the Top Hat Organizer helps students give their thoughts a shape. For this phase, Joanne asks her students to discuss what they have learned as a result of their comparison and to form some conclusions. She uses the questions in Figure 1.5 to guide the discussion. Thinking About Phase Three: Guided by questions, students are forced to distill the evidence they have gathered from the passages and analyze the two readings in greater depth. By asking students to take a position and draw conclusions about the content, we enhance their retention and understanding. Joanne introduces her application activity by saying, “You have seen how specific time periods affect the notion of family and the roles of fathers and daughters. Now you will be asked to synthesize what you have learned in this lesson in a creative task. Think about today's society. How do our time period and culture affect the role that fathers play in our families?” Joanne then introduces and explains the following synthesis task. Pick two universal traits for ideal fathers, whether they come from the 17th, the 19th, or the 21st century. Then pick two more traits that you believe are unique to modern fathers. Use the four traits you select to develop a want ad for an ideal 21st century father. Thinking About Phase Four: Remember the principle of “putting learning to work”? Creating a real-world task and asking students to stretch their thinking beyond the original context increases transfer and helps students find deeper meaning in the content. Figure 1.6 depicts how one student group completed the four phases of the lesson. How does their work compare with yours? Take a moment to reflect on what you covered in this section by answering the questions below. 1. How did the strategy help Joanne to achieve her goals? 2. How did the phases of the strategy support the principles of the strategy? 3. How is the Compare & Contrast strategy similar to what you already do with your students when you want them to engage in comparison? How is it different? Keep an eye out for students who use comparative thinking in your classroom. What steps do you notice them taking? How comfortable are they with comparison? As you teach over the coming weeks, keep track of those times when you might have used Compare & Contrast. Take note of these instances, and be ready to share them as you proceed through the following sections. Compile all the materials you'll need to plan a Compare & Contrast lesson (e.g., content, standards to cover) and bring them to the next meeting with your learning club. Copyright © 2010 by Silver Strong & Associates. All rights reserved. No part of this publication—including the drawings, graphs, illustrations, or chapters, except for brief quotations in critical reviews or articles—may be reproduced or transmitted in any form or by any means, electronic or mechanical, including photocopy, recording, or any information storage and retrieval system.